Note that since middle of 2016 all versions are called Video Pro X, and it upgrades just like Adobe products regularly, but without all this monthly stuff and it will work indefinitely. Thanks, very good offers here. Need to try this editor. Integrated 360 ° video stitching. Videos from 360 ° cameras can be loaded in MAGIX Video Pro X without preprocessing and can be converted into a real 360 ° video, if necessary. Export of 360 ° videos: New project templates for 360 ° videos and a 360 ° display mode for the video monitor allow the creation of 360 ° video. It is also possible to place normal videos and photos in the three-dimensional 360 ° space. Dithering for playing deep-color video on monitors that can not display higher color depths. Deep color support for import and export in HEVC and ProRes. Specification of color space standards when exporting. This ensures the reproducible reproduction during video processing and playback on calibrated projectors and monitors. The Object Properties dialog has been reworked, where you can now also load camera-specific look-up tables. Integrated 360 ° video stitching. Videos from 360 ° cameras can be loaded in MAGIX Video Pro X without preprocessing and can be converted into a real 360 ° video, if necessary. Export of 360 ° videos: New project templates for 360 ° videos and a 360 ° display mode for the video monitor allow the creation of 360 ° video. It is also possible to place normal videos and photos in the three-dimensional 360 ° space. Wow, this is really big news for me. 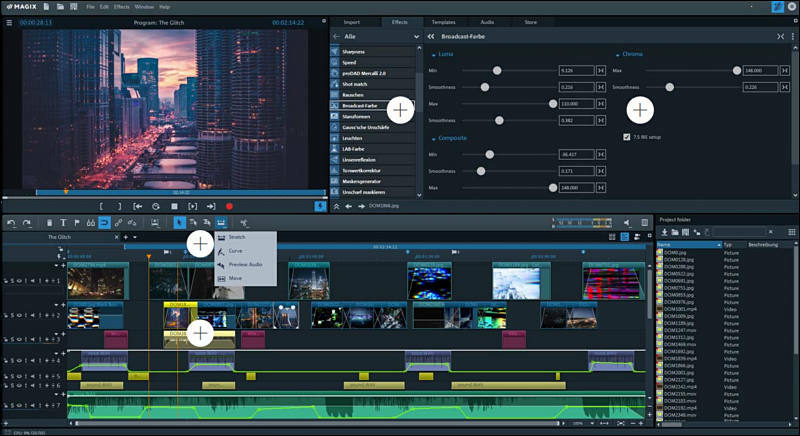 MAGIX is pleased to announce the release of the latest version of its video editing software, Video Pro X. An unrivaled spectrum of innovative features makes Video Pro X the most attractive choice in its price range for video enthusiasts with high creative demands. From 10-bit HEVC decoding/encoding and professional color grading to 360° editing and precise audio mastering, the latest version offers powerful tools for broadcast-quality results. In addition, scalable proxy editing, preview rendering and hardware acceleration enable real-time video editing in HD, 4K and 360°. Built-in 16-bit deep colour processing in Video Pro X provides greater creative freedom and detailed colour correction via the color grading workflow - including true colour space handling for broadcast-ready results in 4:4:4 chroma subsampling. Colour-true processing of material is carried out by precise measuring instruments: vectorscope, waveform monitor, histogram and RGB parade. The software supports all formats from the professional and consumer sector such as ProRes, HEVC 10-Bit, AVC and MPEG-2. Thanks to new support for lookup tables (LUT) in Video Pro X, it can sync flat recordings with LUTs from the camera manufacturer or upload cinematic effect LUTs to create unique film styles. Lookup tables save color grading information and can easily be imported and applied, or custom created and saved. The new version supports a diverse range of formats and cameras from the professional and consumer sector such as H.264 and HEVC/H.265 or formats including ProRes, AVC-Intra and DVCPRO that can be imported via the multi-format timeline and edited without any need for conversion. The integrated tagging & logging function for metadata guarantees a clear overview of all media and takes. To finalize projects, Video Pro X offers professional authoring functions for creating DVDs and Blu-ray Discs. There are also a range of animated templates for menus or the option to create your own. Precise tools for audio restoration, sound mixing, TV-compliant loudness normalization according to EBU R 128 norms and extensive mastering plug-ins are also included in Video Pro X, allowing for professional audio editing at the post-production stage. Thanks to VST2 standard support, audio production plug-ins can be added to Video Pro X at any time. Following mixing, finalize sound via the master channel with the Mastering Suite - including 5.1 surround sound. Audio tracks can be exported to hard drives or transferred to external audio editors using the interface (EDL). Video Pro X offers a range of GPU-optimized video effects for creative editing. The new professional-sector effects are a particular highlight and include broadcast colour, tone value correction, LAB adjustment, noise and blur masking effects for broadcast ready results. Use masks to apply effects to specific areas of the image or attach media to moving elements with the professional object tracking feature. There's a whole range of additional features for finalizing productions, such as captions, text fades, title templates, travel route animation and intros and outros. Considering LUTs, actually they had support for quite a time. But it was kind of hidden. Now they have predefined LUTs for LOG profiles, including Panasonic VLOG, so doing fast initial processing is one click. They have trial, so easy to check yourself. I startet editing video with Magix video pro x 2 some years ago because it was the only editing programm my old Computer could handle. I still like it, but it is far from being perfect. I did not know, that it could handle luts, after adding this and hevc Support, it is now all i need to edit Videos. it is stable and fast. 199$$ upgrade offer to X9 was sent to my email today. As you can update if necessary Video Pro and have also 2 very good progs. Actually this programs are usually ahead of Video Pro X (update posted above actually matched 360 and such features, but 8 months later). In the end. Situation with NLE developers is horrible and it is very similar across the board. In the December 2016 patch, important internal color grading workflow processes were switched to 16-bit deep color. How has this enhanced editing options in the latest version? The December patch laid the foundation for deep color in Video Pro X. In this step, the most essential processing was switched from 8-bit to 16-bit deep color. This made it possible for the first time to import HEVC 10-bit material and export it again without having to experience any loss in quality. The latest version of Video Pro X is now even more detailed and we’ve finalized the color grading workflow for deep color. With settings for color depth, color space and chroma subsampling, the user now has total control over their workflow and results. Thanks to lookup table support, we have also switched internal effect calculation to LUTs. This step alone has brought the program to a new level of quality and has also improved performance. Users with a monitor including deep color support can also optimize export for their monitor in the latest version. What other new features does the new version have in store for users? The new Video Pro X version is our biggest update since version 1. In addition to internal modifications and optimizations, the new version includes a wealth of new features: Color grading in deep color, lookup tables support, new professional effects/features, 360 degree editing with stitching and wireless media and project transfer. What are they all about and how do they work together with the shot match feature? Lookup tables are the professional video production standard in the sector nowadays. Lookup tables (LUTs for short) save color grading information, offering total freedom of interpretation for your video material. Thanks to new support for lookup tables the program can synch flat recordings with LUTs from the camera manufacturer or upload cinematic effect LUTs to create unique film styles. LUTs can easily be imported to Video Pro X and applied, or custom created and saved. Best of all: Editing using LUTs significantly reduces load on your CPU/GPU. How has the software performance improved? Let’s just say this: a lot! We’ve worked extensively on the stability and performance: From improved hardware speed on export to speed optimizations thanks to intern lookup table processing, to inking the logic behind the preview monitor, quite a bit has changed – and the user will immediately get a sense of this when working with the software. Playback performance alone is now 5 times smoother than before – even with 4K material. HEVC/H.265 video export is now backed by NVENC support, which makes it possible to outsource export processing to the GPU's hardware encoder. Video Pro X's AVX optimizations for internal image processing and 3-way color correction make image processing much faster, deliver much more precise output quality on color conversions and free up resources for the use of additional effects. Visibly reduced sparkle and fewer Moiré patterns in exported Full HD videos. Apple's latest image format can now be imported into Video Pro X. Together with HEVC import, this provides excellent support for media from Apple's iPhone 8. Trim audio and video independently with a convenient shortcut key. Documentaries and interviews are now easier than ever before to edit thanks to a fluid workflow and overlapping objects. Video object contents can now be easily selected in a manner which maintains the editing rhythm. The latest in effects versatility from Video Pro X. Effects purchased for Movie Edit Pro can be used in Video Pro X. A fundamentally new control concept and a completely new technological basis change the way plug-ins and effects dialogs are integrated and controlled. Equipped with antispill and an improved extraction algorithm, the green/blue screen preset delivers high-quality results. The OFX plug-in interface supports plug-ins requiring the use of more than once processor core. Shaky 360 footage can be corrected fully automatically. You can also apply 360 stabilization to stereoscopic videos. First line in extremely important as it allows to significantly improve old computer performance just adding cheap GPU. On the occasion of the software's 10 year anniversary, MAGIX Software is introducing the largest update for Video Pro X ever to the market. 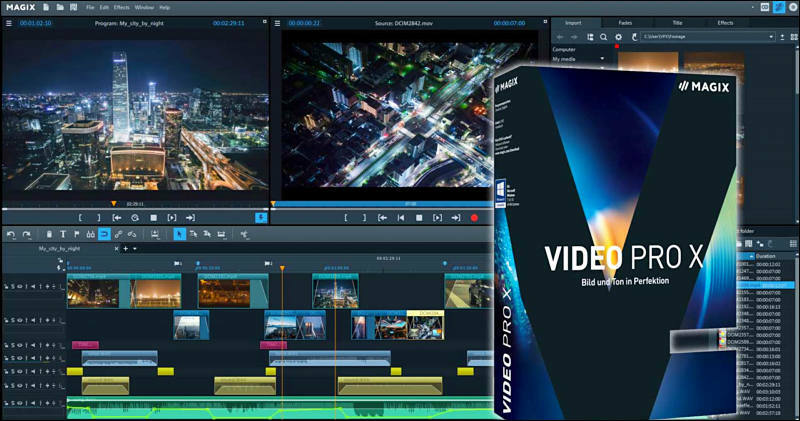 The anniversary version of the professional video editing program includes numerous new functions and improvements for significantly more power, productivity, and design flexibility. The latest Video Pro X has arrived. 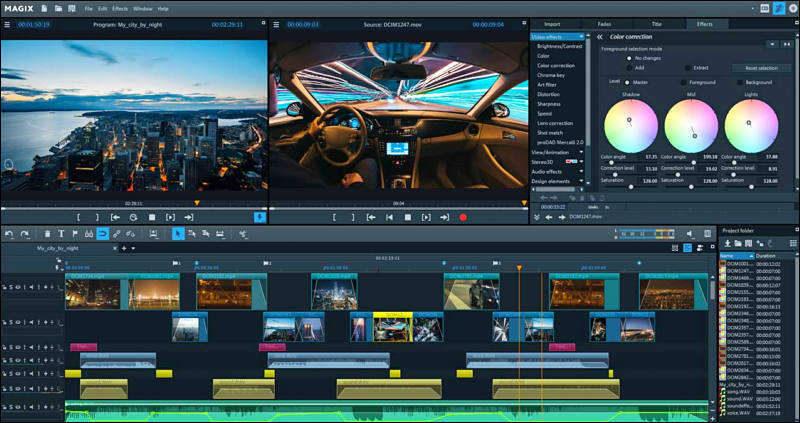 Right on time to mark the anniversary, the powerful video processing system from MAGIX offers an extensive program of intelligent new and optimized features that help ambitious users to achieve high-end results even faster than ever before. The most recent update from MAGIX had already put a strong focus on increased performance. However, the new version introduces the largest performance leap ever. For the first time, HEVC/H.265 video export can now be rendered with the NVIDIA GPU's encoder. This makes export speeds possible, which were inconceivable in the past. Also new to the latest version is the comprehensive AVX optimization in the internal image processing and the 3-way colour correction resulting in faster image processing and much more precise output quality during colour conversion. Additionally, the output of 4K source videos into FullHD quality has been optimized by reducing high-frequency image components. This results in fewer bit errors during the conversion of high-resolution recordings. With the new Video Pro X, MAGIX pushes ahead with its workflow optimization strategy. The latest improvements include the new time-saving J-L cut and the intuitive "Move object content" mouse mode. With J-L edits, video and audio tracks can now be modified individually without losing the advantages of working with grouping. For video editors who work regularly with overlapping objects, such as spoken audio spanning several scenes in documentaries and interviews, work will become noticeably easier, and object content can now be moved more flexibly. From now on, users can intuitively select and adjust image content from video objects with a click of the mouse while maintaining the editing rhythm. The Video Pro X effects area has been enhanced and is now more clearly organized and user friendly than ever. Users can quickly navigate to the effects they want and control plugins much more intuitively meaning the creative workflow stays uninterrupted. Chroma Keying has also been optimized in response to customer feedback. A new algorithm supports the ability to recognize and extract objects. 360° editing was also improved. 360° image stabilization, a set of spectacular 360° transitions, and special 360° effects from HitFilm now supplement the Video Pro X 360° editing package. And now even stereoscopic videos can be processed by Video Pro X. "10 years of development have been invested in the new Video Pro X. We would like to introduce the largest update in the history of Video Pro X as a way to say thank you to our loyal customers. 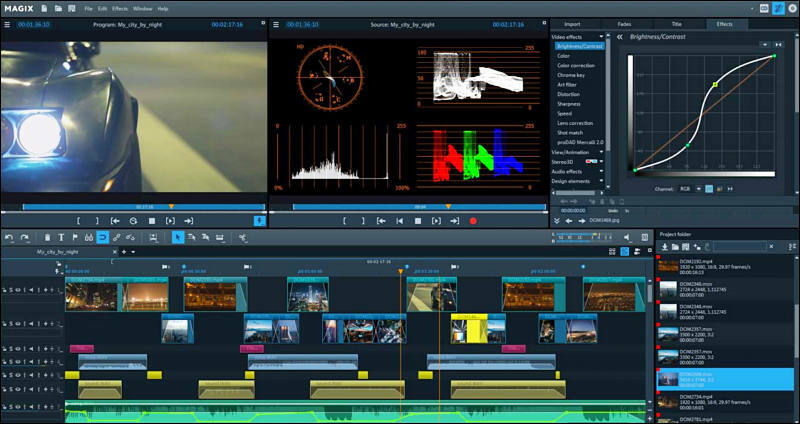 Without the continuous feedback from the Video Pro X community, the software would by far not be as sophisticated and powerful as it is today," says Florian Liepold, Product Owner Video Pro X at MAGIX. Video Pro X comes with a year of Update Service free of charge. So, users who now decide to purchase the software will automatically receive any upcoming updates. For example, the flexible anchor point positioning, an intelligent function that helps to individually select the object focus -- for maximum design flexibility while scaling and rotating. We hope to organize dedicated interview about all most advanced features. Why do they keep both this and Vegas Pro, rather than merging them together? Because it is smart company. They share some code and stuff, but keep development teams. Outside US both their Video Pro X based line and Vegas have small but strong following.